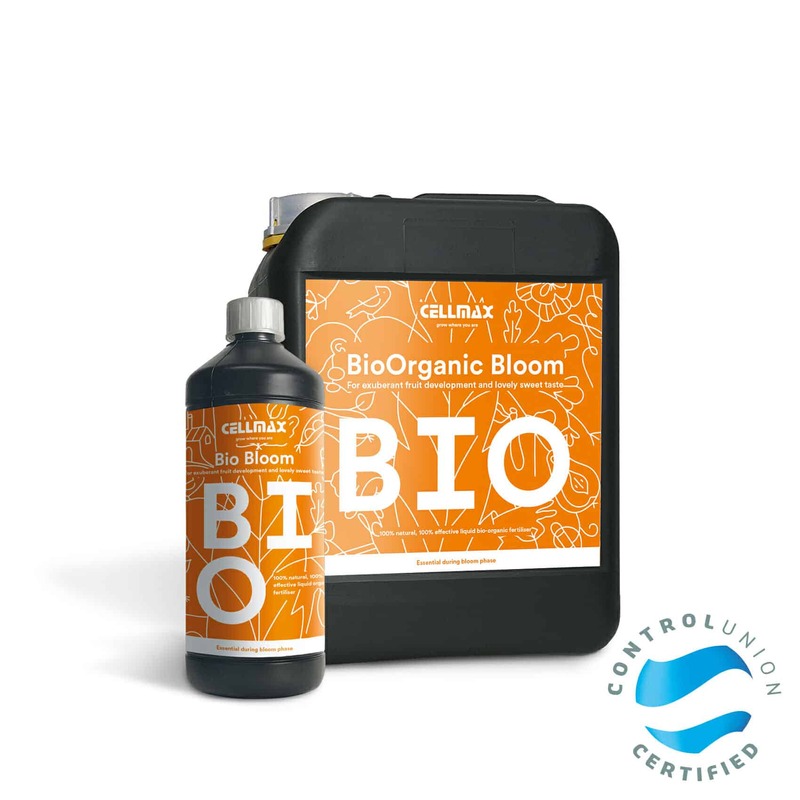 The Cellmax Bio-Organic Bloom is an easy to use liquid Organic fertilizer designed for plants that are in their flowering period. This product guarantees an explosive fruit development and a perfect taste. Bio-Organic Bloom is completly vegetable based and does not contain any traces of animal waste. This product is audited and evaluated by Control Union certifcations and is approved as input for Organic Horticulture and Agriculture. This Natural Bio-Organic fertilizer has been especially developed by Cellmax Nutrients as a one component fertilizer for cultivating organic plants. Bio organic-Bloom exhibits outstanding results in organic cultivation in soil for Indoor and Outdoor use.This product contains 100% plant based ingredients and is added with extra proteins, vitamins and beneﬁcial natural acids to create optimal ﬂowering conditions. Can be used on all soil types. Directions for use: Shake well before use. Dilution ratio: (1:250) 4 ml to 1 liter of water. Content: Contains trace elements, and fermentations. Easy to use NPK 2-2-5 special balanced for Flowering period. Bio-Organic Bloom works best with hand watering. Guideline: Apply to your plants 2-4 times per week in Flowering phase. Tip: Take the oportunity to use this product together with our Cellmax BIO-Organic Grow formula to achieve an optimum results. Warnings: Do not prepare the solution for more than 48 hours in advance. Nutrient solution does not need to be pH adjusted. Storage: keep bottle closed in a cool, dark and frost-free place.